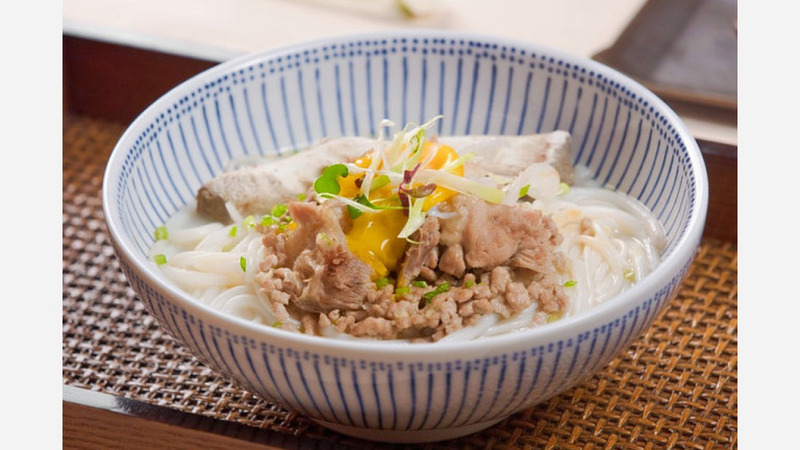 A new contemporary Chinese spot offering noodles and more has debuted in the East Village at 112 First Ave. Called Hunan Slurp, it specializes in noodles prepared in the style of chef-owner Chao Wang's home province of Hunan. On the menu, diners can expect to find appetizers like the Hunan charcuterie, with beef tripe, pig's ear and pig's tongue; and the Hunan salad featuring grilled pepper, grilled eggplant and duck egg. The narrow eatery has a modern aesthetic with minimalist hanging pendant lights, strips of light wood arched across the walls and ceiling, and both communal tables and banquette seating. The new arrival has gotten an enthusiastic response thus far, with a 4.5-star rating out of 28 reviews on Yelp. Nono Z., who was among the first Yelpers to review the new spot on June 8, said, "I am originally from Hunan, and this place offers the most iconic Hunan dishes. The flavors are great, spicy but also very refreshing. The spare ribs, fish fillet mifen, skewered beef and the cabbage all taste amazing." "The food was authentically prepared, and the portion size was proper," Yelper Julie W. said, but called the high prices, "The one mentionable downside."